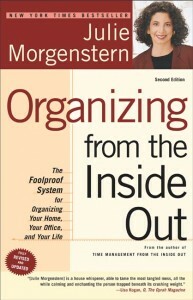 Organizing From the Inside Out can really help anyone become better organized for a better life. I have found it extremely helpful in rearranging and clearing the clutter from my life. This process brings a wonderful freedom and clarity to life. It is amazing how great it feels! Many of us try hard to be organized and end up cluttering our house with organizing books, baskets, filing cabinets, and other gadgets. We get our house almost organized, yet find there’s one room or task we just can’t do. Are we sabotaging ourselves? Yes, according to Morgenstern. She quotes, “You can’t fix it till you know what’s broken” and explains that until you know why you stray toward disorganization, you will never master it. Psychological obstacles are one of three factors in clutter, according to Morgenstern (the other two are errors in your “organizing system” and external realities. But she deals with the psychological aspect in a brisk, energizing chapter that actually motivates you. The Analyze and Strategize sections are actually very useful and are easy to tackle. You will need a notebook, and will go from room to room answering 5 questions: What’s working? What’s not working? What items are most essential to you? Why do you want to get organized? (i.e., in the kitchen the answer might be – stop wasting money on duplicate purchases), and What’s causing the problem. She advocates creating zones in each room. Again, a kitchen example might be: food prep zone (counter space between sink/fridge), daily cooking zone (build around oven and cooktop), daily dishes zone, food serving zone, and food storage zone. You’ll learn to store items for each zone near that zone. No sense keeping dishes in cabinets near the food prep zone and corningware near the dishwasher zone. Once you get a solid grasp on the three steps, you can take your notebook through the house and quickly identify what needs to be done, room by room. While this isn’t a “organize your house in one hour” kind of book, it also doesn’t bog you down. The essentials are basic and what I’ve listed above, and they help you get the prep work out of the way while setting a solid foundation for you to tackle the clutter. You will see a real transformation of your house – or of whatever rooms you attack. It’s not just a matter of “cleaning” them. You will turn them into efficient workcenters.